Christianity is a doing religion. We are not saved in order to become statues in a museum; rather, we are saved to become active doers of God’s will in this world (ref. James 1:22). It should be no wonder that our Lord so often commanded His followers, and us, to “Go!” and do something. Over the next several weeks, we’re going to explore Jesus’ “Go!” statements and what they mean for us today. 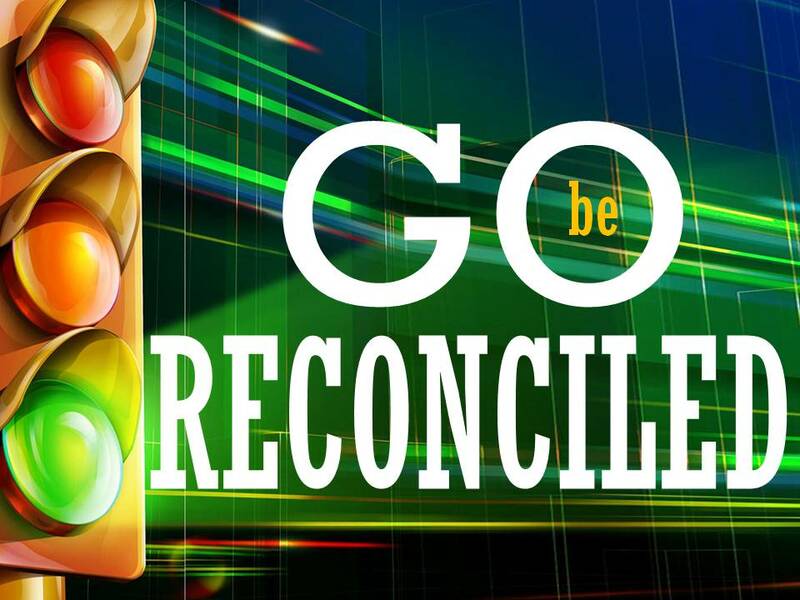 In our first lesson, well consider two of our Lord’s “Go!” statements under the title Go Be Reconciled. In the Sermon on the Mount, our Lord’s uncompromising interpretation of the sixth commandment, “Thou shall not murder” (Exodus 20:13) went beyond the act itself and addressed the inward attitude of hate, which, according to Jesus was just as culpable as murder (Matthew 5:21-22). Jesus taught the positive counterpart to the anger described in vv. 21-22 is extreme reconciliation. To stress the high importance of reconciliation, Jesus presented a picture of a worshiper traveling some distance to offer sacrifices on “the altar” at the temple in Jerusalem. Suddenly, the worshiper “remembered” he had offended a brother. Jesus advised the worshiper to leave his sacrifice at the altar, immediately seek to be reconciled with his brother, and then come back and present his offering to God. The urgency of this scenario illustrates Jesus’ high importance on confessing sins and seeking reconciliation. Think about the absurd image of two worshipers separated by sin seeking to worship together. By staying, the man who wronged his brother would have fulfilled the outward aspects of the Law, i.e. sacrificial worship; nevertheless, his outward piety would have been tainted by his sinful act(s) of hatred toward his brother (cf. v. 22). Jesus went on to illustrate the importance of seeking reconciliation with another parable in vv. 25-26. We, who have wronged someone else, are to take the initiative to seek reconciliation for the wrongs we have committed. In this way, we can fulfill not only the Lord’s command, but Paul’s as well, “If it is possible, as much as depends on you, live peaceably with all men” (Romans 12:18). As I recently learned from one brave sister, you cannot make someone change his or her mind about you, but you can make every effort to extend an olive branch and be a “peacemaker” (ref. Matthew 5:9). Nevertheless, our spiritual lives depend on it. Although many offenses against us can and should be overlooked (ref. Proverbs 19:11), there are sins that must be addressed so that reconciliation can occur. Unlike our previous passage, in Matthew 18:15, Jesus puts the ownness for seeking reconciliation on the one who has been sinned against. When considered in the context of the parable of the Lost Sheep (vv. 10-14), it becomes abundantly clear Jesus had something more in mind that a toe-to-toe confrontation with a sinful brother or sister. Rather, He is clearly calling for us to go seek reconciliation with the goal of bringing a lost soul back to the fold of God. This theme of restoration is echoed throughout scripture, as Christians are urged to “help” (1 Thessalonians 5:14), “restore” (Galatians 6:1), and “save” (James 5:20) those who are caught up in their sin. The other side of this coin is that we also need to be quick to forgive in order to achieve reconciliation. Christians are the most forgiven people in the world. Therefore, we must be the most forgiving people in the world. So, when someone comes to us seeking reconciliation and thus our forgiveness for the wrong they did against us, let us, with “compassionate hearts, kindness, humility, meekness, and patience… forgive [them]; as the Lord has forgiven [us], so [we] also must forgive” (Colossians 3:12, 13; cf. Matthew 6:12, 14-15; Mark 11:20-25). But how many times should we forgive those who sin against us? As often as needed, the Lord said, “If your brother sins, rebuke him, and if he repents, forgive him, and if he sins against you seven times in the day, and turns to you seven times, saying, ‘I repent,’ you must forgive him” (Luke 17:3-4). What the world needs are more “peacemakers.” Christians who will seek to correct their wrongs. Brothers and sisters who will seek to lovingly bring others back into fellowship. Christ imitators who are quick to forgive. Who is someone you have wronged, or has wronged you, or who is someone you have withheld forgiveness from? Will you obey your Lord and go and be reconciled with them today? So, so true. I have always struggled with forgiving others and even more with accepting forgiveness and forgiving myself. But forgiveness is such an essential part of the Christian walk. I couldn’t agree more. Thanks for sharing this! Thank you for the comment Leah.